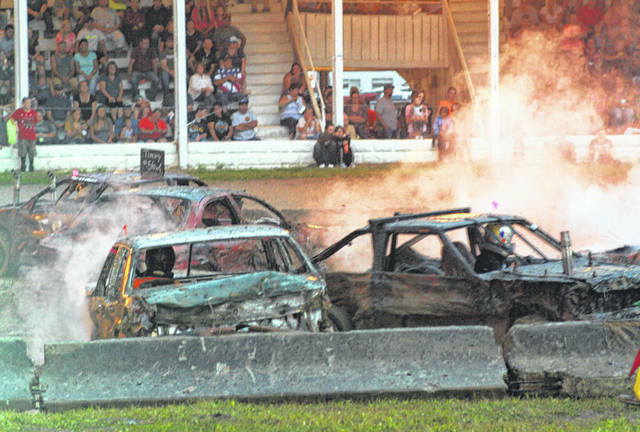 ROCKSPRINGS — Despite on and off rains and the occasional flash of lighting in the distance the Demolition Derby will held on the opening night of the 155th Meigs County Fair. The rains hit the fairgrounds right at the scheduled start time of the fan favorite, but despite the rain the grandstands were full along with people surrounding the track in the trucks watching the action. 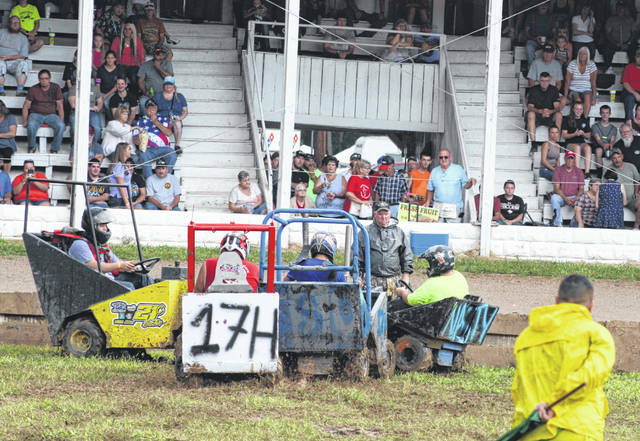 The derby also featured riding mowers and action for the kids in their small motorized vehicles. 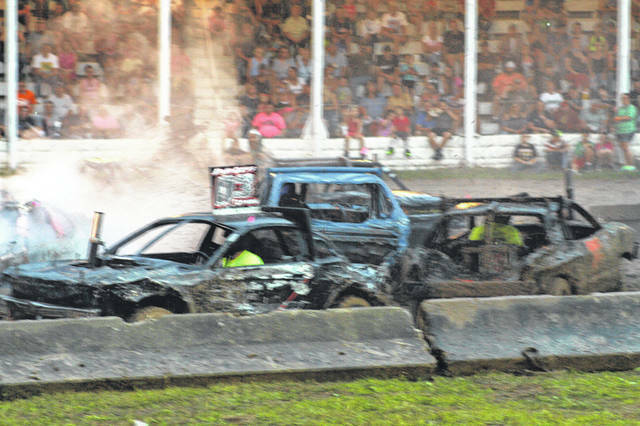 Events at the track and Grandstand continue throughout the week with events such as motorcross and truck and tractor pulls. Both Thursday and Friday afternoons will feature harness racing with para mutual betting at the Grandstand beginning at 1 p.m. each day. On Thursday evening, the OMPTA and tractor pulls will be held on the pull track at 6 p.m. sponsored by Mark Porter GM Supercenter, with motor cross at the Grandstand at 7 p.m. sponsored by Kim Dodd, LulaRoe Retailer. 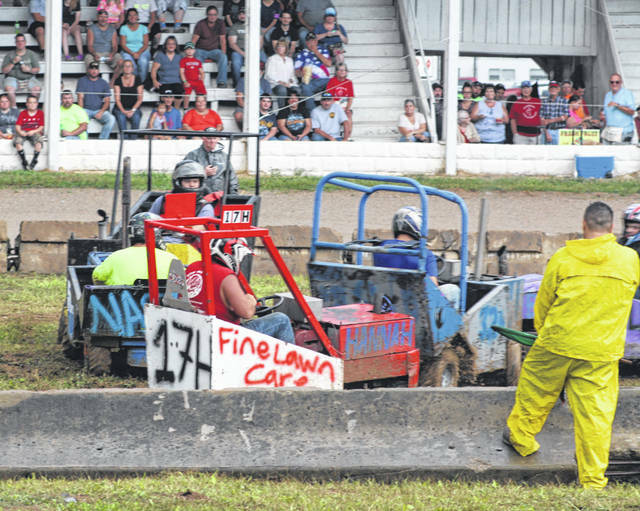 Classes for the Thursday evening pulls, according to the fair premium book, include: 6,000 pound modified farm stock; 6,500 light mix tractor; 10,000 pound tractor 8 MPH; 10,500 pound tractor 3K RPM; 8,500 pound street stock diesel pickup; 6,000 pound local yokel; and OMTPA classes 5,200 pound single engine modified tractor, 6,500 pound multi engine modified tractor, and 6,500 pound light limited super stock tractor. Friday evening will be the truck and semi pulls on the pull track at 6 p.m. sponsored by Fox’s Pizza. At 8 p.m., the horse pull is scheduled to take place at the Grandstand. Classes for the Friday evening truck and semi pulls are as follows: 6,000 pound four-wheel driver modified stock truck; 6,350 pound four-wheel drive modified; 5,800 pound four-wheel drive super stock; 6,350 pound four-wheel drive modified; 6,200 pound four-wheel drive cheater; 6,200 pound four-wheel drive modified stock; 8,000 hot one ton four-wheel drive diesel; 8,000 pound 2.5 street diesel; 8,500 pound 20 MPH diesel; semi. Saturday will feature a day of events on the pull track with ATV pulls at noon, the youth tractor pull at 3 p.m. sponsored by Calaway Farms and the “hot” garden tractor pull at 7 p.m. 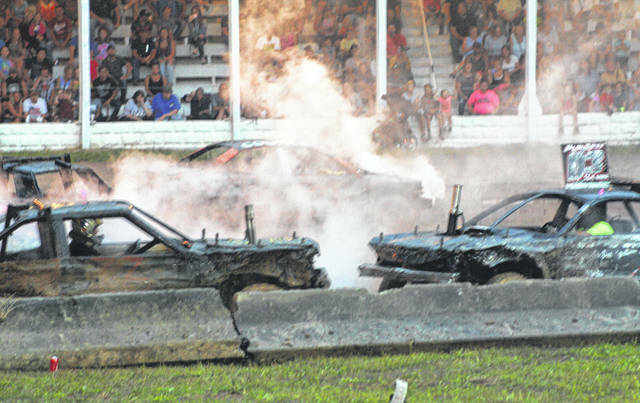 The Tough Track competition will take place at the Grandstand at 7 p.m.
Fireworks will conclude the week’s activities at 9:30 p.m. on Saturday sponsored by J&M Auto Sales. Sentinel freelance writer Dave Harris contributed to this report.